"Our little darling is gone. Budded on earth she will bloom and bear fruit in the garden above. 'Those little garments no more she'll need - Lay them all away - She's gone up the golden ladder - Into the eternal day.' C.P." What a beautiful tribute! 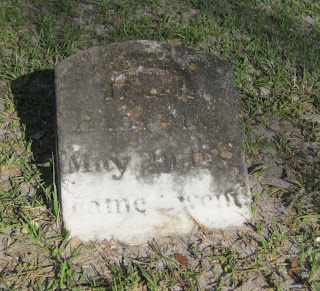 When I looked for Katie's grave on the Sunset Hill Cemetery interactive map, I found Baby May who is buried next to her. I wondered who May belonged to. The closest graves of any Pendletons are to the east and across a cemetery road---those of their grandparents Philip Coleman Pendleton and Catharine Tebeau. Katie's and May's graves seem to be all alone. 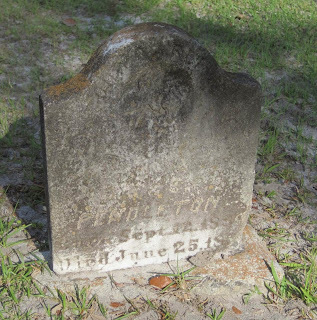 The cemetery website has May's last name as Pendleton. Several family trees on ancestry.com list a daughter of Charles and Sally named Mary with the same death date as May. I searched for an obituary for May but didn't find one. of C. R. and S. P.
Katie's headstone and May's headstone on findagrave.com were much more legible a year ago than they are now and when I took my photos this past May. How sad to lose one's first two children! Charles and Sally's third child, Charles Rittenhouse, was born on May 15, 1883, almost a year after May's death. He survived into adulthood, and so did the rest of their children Luelle, Philola, Edmund, Carita, Vida, Louis, and Zera. Wayne and Judy Dasher. Wiregrass Obituaries and Death Notices Volume 1, The South Georgia Times - April 29, 1868 to September 29, 1869; The Valdosta Times - May 15, 1875 to December 26, 1885. Privately published, 1998. Repository South Georgia Regional Library, Valdosta, Georgia.